Tennessee Prison for Women is a mixed custody prison that houses females and is located in Nashville Tennessee. This facility is designated as a maximum security prison, but holds all custody levels including inmates on work release and women who are on death row. Tennessee Prison for Women is also responsible for the intake and classification of all female inmates in the state. During this process offenders are fingerprinted, photographed and a complete medical and criminal history is taken. Offenders are also given several exams to determine the programs and facility that will best accommodate their needs and security level. Tennessee Prison for Women offers a work release program to eligible offenders who close to their release date. The work release program allows the inmate to leave the facility during the day to attend a job and return to the institution at the end of their shift. This allows the inmate to experience more responsibility and prepare financially for release. Tennessee Prison for Women has several alcohol and substance abuse treatment programs available. Inmates can also take educational classes to earn a GED and vocational courses in cosmetology, culinary arts, computers, and various construction trades. One of the more unique programs at Tennessee Prison for Women is the weekend child visitation program which allows the offender to have up to two of their children stay the weekend with them. Read more about the Child Visitation Program here. Visitation at Tennessee Prison for Women occurs on Saturdays, Sundays and State Holidays from 8:30am-3:30pm. Visitors are processed into visitation from 8:30am-10am, from 11:30am-1:30pm and from 2:30pm-3pm. Inmates who are unable to have visits on Saturdays and Sundays are allowed visits on Fridays from 5pm-8:30pm, the cut-off time for visitors to arrive is 8pm. 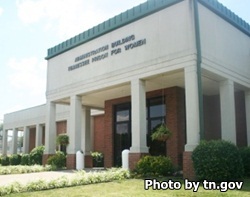 For more information on visiting inmates at Tennessee Prison for Women read the visitors handbook.